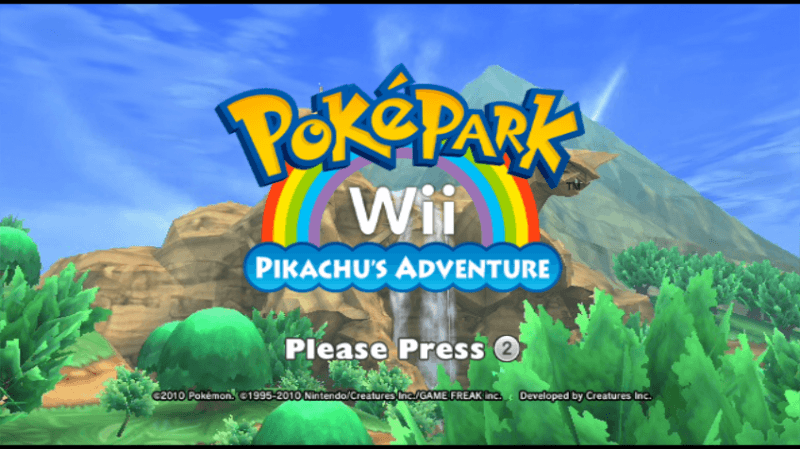 Released on Nintendo Wii, PokéPark Wii: Pikachu's Adventure is an adventure and action spin-off Pokémon game, in which the player uses Pikachu, as the main character, to collect Sea Prism Pieces in different locations by clearing their respective attractions. In order to finish these challenges, Pikachu will have to cooperate with other Pokémon and earn their friendship, through fun Skill Games that range from racing to quizzes. 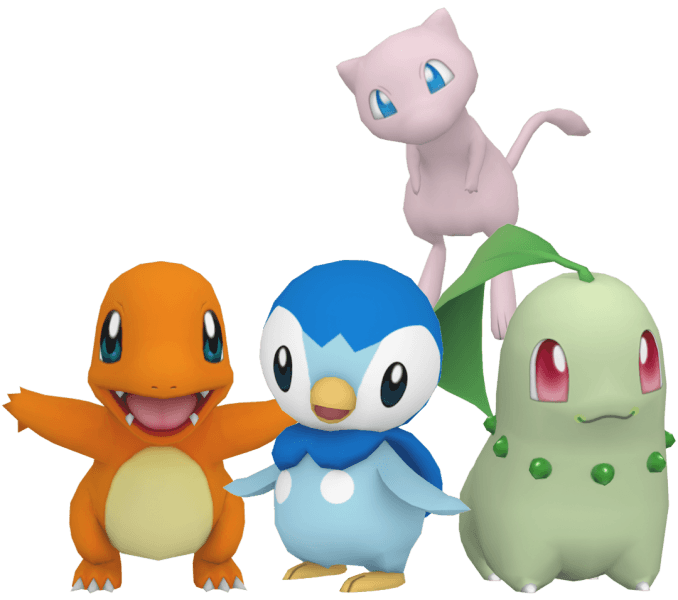 The game features a large number of Pokémon from different generations, all represented by smooth and vivid 3D models and animations. Like most of the Pokémon games, the music themes and soundtracks were also greatly conceived and fitting for the various environments. Additionally, one would notice that the game uses actual Pokémon voices from the anime instead of generic cries. Upon collecting the final piece, Pikachu and his Companions will return to the Flower Zone, where they meet Shaymin who helps them fly to the Sky Pavilion. There, the Pokémon search together for Mew, but in vain. They soon notice there is another Piplup, who turns out to be Mew. Mew then informs Pikachu that they need more friendship energy to restore the Sky Prism to its original state, and that building friendship between him and Pikachu should suffice. To do so, he invites Pikachu to three Skill Games: Obstacle Hop, Battling then Racing. Upon finishing all three, the two Pokémon become friends and the Sky Prism is finally restored, bringing peace to the troubled PokéPark. Run, Jump, Smash! Play as Pikachu and save the PokéPark! Experience the action-packed Attractions at the PokéPark! Zip across land, sea, and sky to show off your speed and skill! Dive into a new world of adventure in the PokéPark! 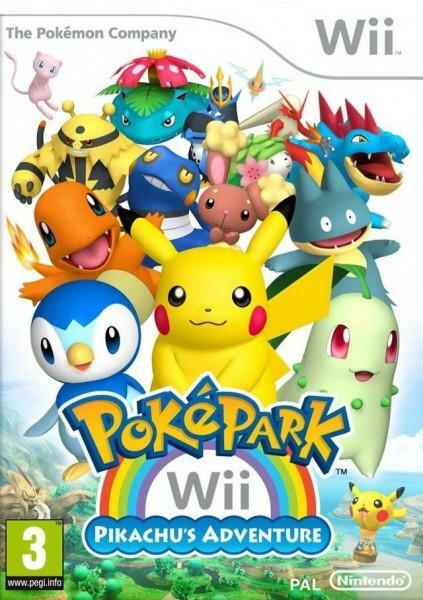 PokéPark Wii: Pikachu's Adventure, as the name suggests, takes place in the PokéPark where a wide range of Pokémon coexist far from Human contact. 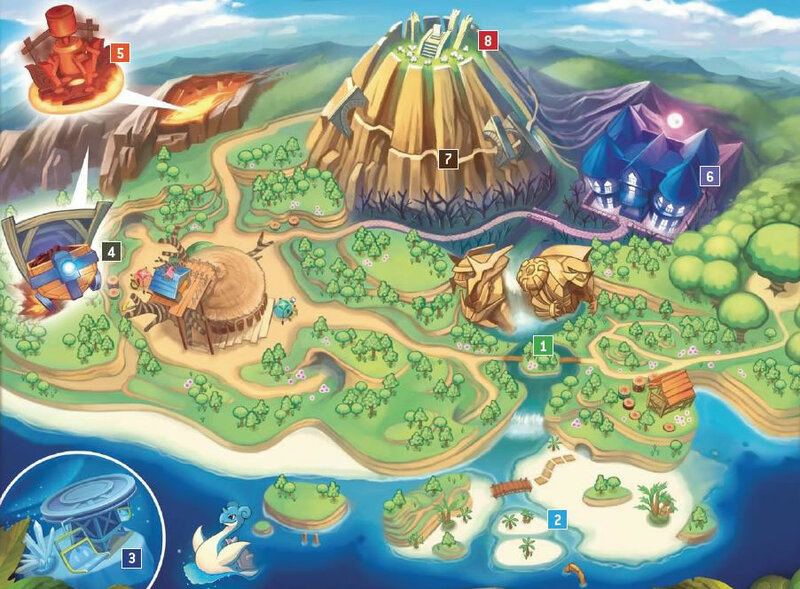 The PokéPark contains 8 zones, the Entrance, the Meeting Place and the Sky Pavilion. A map of the PokéPark. 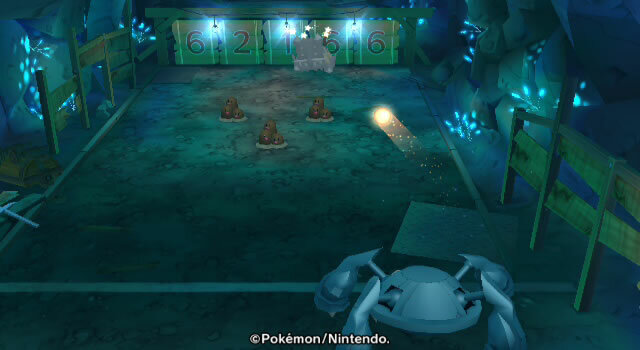 The PokéPark Entrance: It is the first area the player visits and where the tutorial takes place. Pikachu will meet Chatot here who'll teach it the basic game commands and moves. The Meeting Place: The main hub of PokéPark which leads to other locations and where tasks such as Powering Up Pikachu take place. The Meadow Zone: A grassy place with a flowing river and rocky shapes of Dialga and Palkia. It is inhibited by Grass and Bug Pokémon. The Beach Zone: A sunny Beach with palm trees, where Water Pokémon live. The Iceberg Zone: A snowy mountain and home of Water and Ice Pokémon. 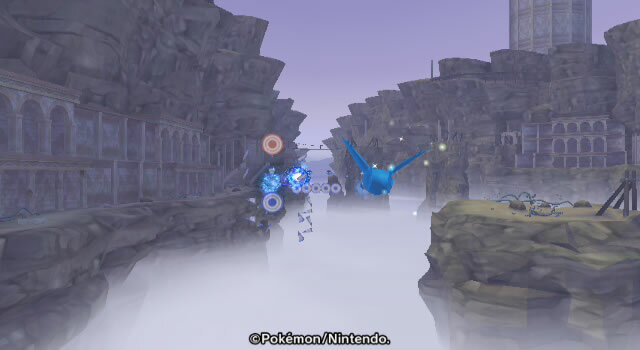 The Cavern Zone: A cavern like mine decorated with rails, where the player will find Ground and Rock Pokémon. 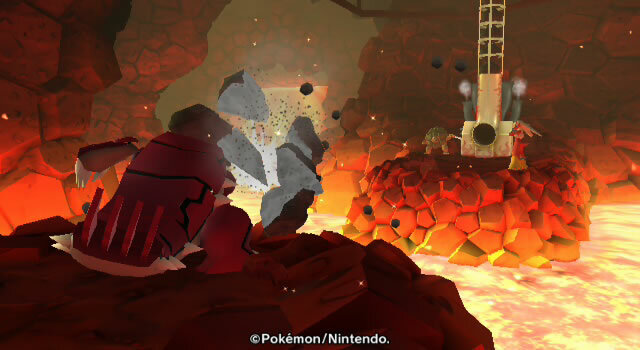 The Magma Zone: The inside area of a volcano, filled with Fire Pokémon. 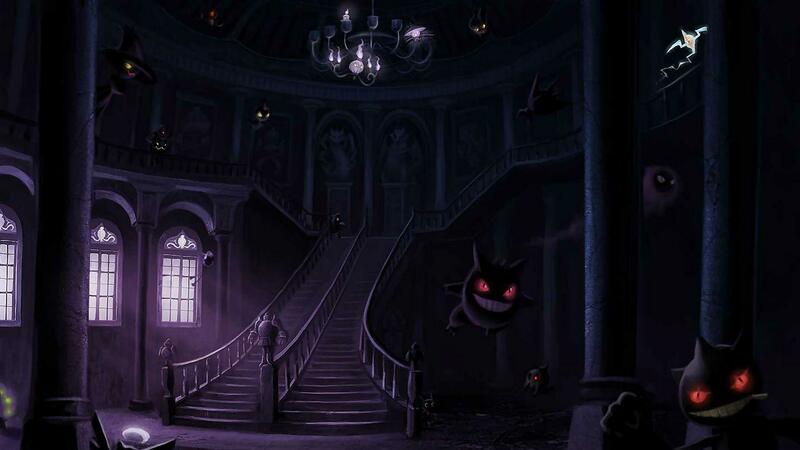 The Haunted Zone: A haunted house where a lot of Ghost and Dark Pokémon dwell. The Granite Zone: Dusty ruins filled with dragon statues. The Flower Zone: An area situated on top of a mountain where a variety of Pokémon can be found. 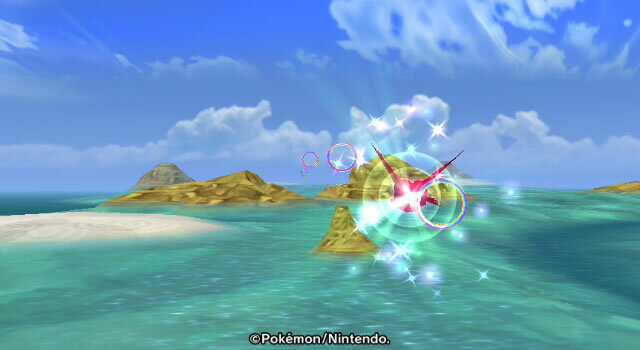 The Sky Pavilion: A deserted area and the final one in game, where Pikachu befriends Mew and restores the Sky Prism. Bulbasaur's Daring Dash: A race between several Pokémon. Mew is the best fit for this attraction. Venusaur's Vine Swing: The player has to swing the Pokémon on the vine, then release it and try to reach the furthest possible. Jirachi is the best fit for this attraction. 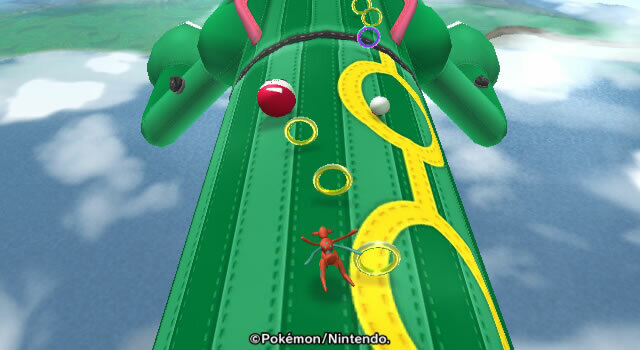 Pelipper's Circle Circuit: The Pokémon has to go through rings on the circuit to earn points. The rainbow reward requires 1000 points, the red 300 points and the gold 100. Latias is the best Pokémon to use for the circuit. Gyarados's Aqua Dash: The player has to dash through the waters while avoiding the Sharpedo and Carvanha that will slow the Pokémon down, and aim to get the speed boosts that will make it go faster. 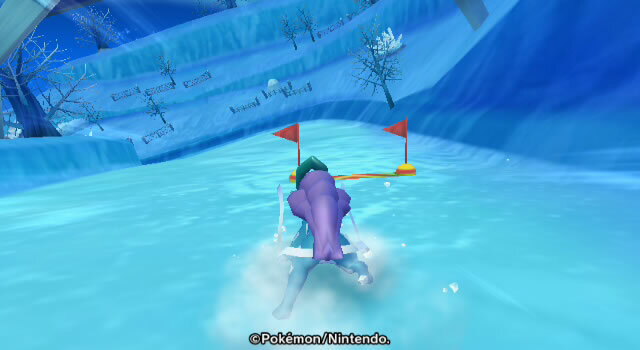 Empoleon's Snow Slide: Pokémon has to ski while avoiding obstacles and walls that will slow it down. Speed boosts will increase its speed but might make the course harder. Bastiodon's Block Barrage: The Pokémon used has to hit the ball and aim for the wooden panels behind Bastiodon to score points. Hitting a panel with a normal shot will score 100 times its number while hitting it with a power shot will score 200 times its number. 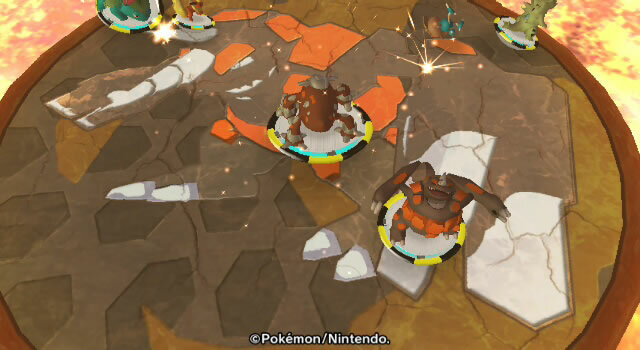 Hitting Bastiodon with a power shot will make it dizzy, while hitting the Dugtrio that pop up from the ground with the ball, might either deflect the ball or push the Dugtrio underground, letting the ball pass. Metagross is the best Pokémon for this attraction. Rhyperior's Bumper Burn: The player must knock the other non-befriended Pokémon out of the ring to earn points. Pokémon skills can be used to unleash different attacks. Heatran is the best choice in this case. Blaziken's Boulder Bash: The player must deflect the rocks the machine shoots at them. The points earned will depend on the attack timing. If the attack isn't on time the player earns 100 points. If they manage to get a perfect timing they earn 300 points. If the used Pokémon gets hit by a rock, it will get dizzy and must recover fast. Groudon is the best Pokémon to use for this challenge. Tangrowth's Swing-Along: The goal is to successfully jump from rope to rope without walling. Celebi is the best Pokémon to use here. Dusknoir's Speed Slam: A race similar to Bulbasaur's Daring Dash but with inevitable obstacles. 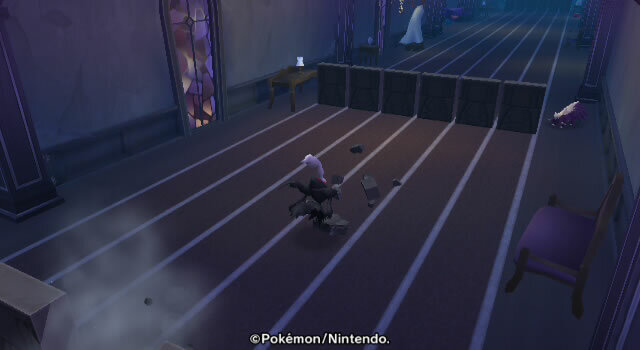 The obstacles can be avoided if a Ghost type Pokémon is used, which allows it to simply go trough them. Best Pokémon to use is Darkrai. 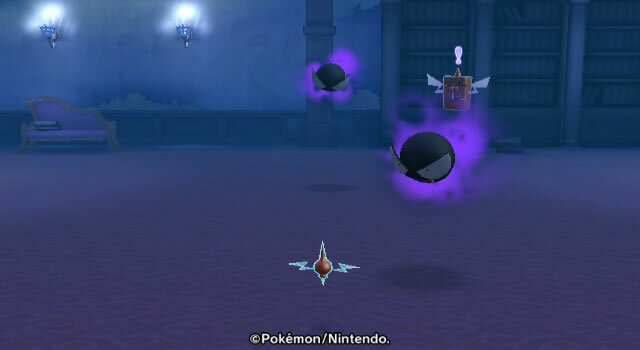 Rotom's Spooky Shoot-'em-up: The Pokémon must defend itself from the waves of Gastly and Haunter coming at it, by shooting them. Using Rotom is highly advised. Absol's Hurdle Bounce: A race similar to the two other dash races, but with hurdles on which the player should jump. 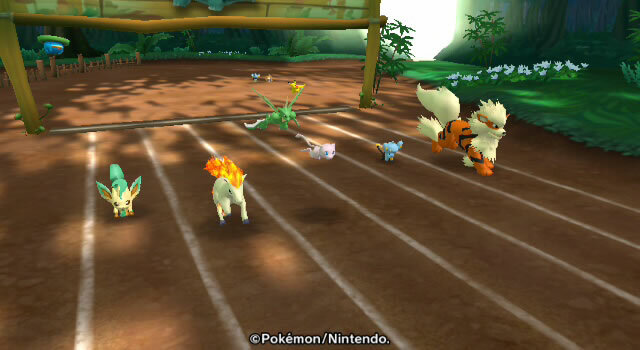 Shaymin is the best choice, as it transforms into its Sky-Forme at the beginning of the race. Salamence's Air Ace: The Pokémon has to fly while shooting aerial targets to earn Points. Latios is the best Pokémon to use for such course. Rayquaza's Balloon Panic: An attractions that's formed of two phases. Phase one consists of running on the Rayquaza like balloon dodging the Voltorb and Electrode. Second phase, is reached at the end of the balloon, as the Pokémon stops and will now have to shoot aerial targets held by flying Pokémon. Sometimes a "trap" target that removes points will be used and the player has to be cautious, not to hit it. Deoxys is by far the best Pokémon for the attraction. Chase: A tag race where Pikachu has to catch the Pokémon by dashing through them. Some Pokémon will try to hinder Pikachu's mobility by setting obstacles. Battle: A duel in which Pikachu has to lower the Pokémon's Health Points using its attacks. The duel actually obeys the elements weakness/strength rules, thus some Pokémon might be more vulnerable to Pikachu's electric attacks than others, while some might be completely immune to them. Hide & Seek: A simple hide and seek game, where Pikachu has to find the Pokémon. As Pikachu gets close to them, it will start hearing their cries, which makes it even easier. 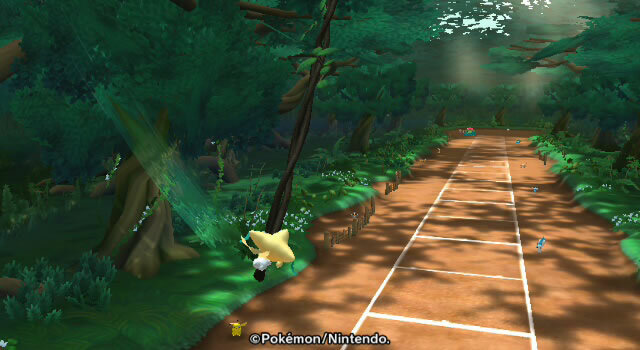 Obstacle Hop: Pikachu has to finish jumping from a platform to another, within a time limits of 99 seconds. If Pikachu falls it has to restart from the first platform. Quiz: A quiz game where the player has to give the right answers for the questions asked. Powering-Up Pikachu: Within the Meeting Place there are 4 Pokémon that help Pikachu Power Up its skills, in exchange of a certain amount of Berries. Electabuzz improves Thunderbolt, Ponyta improves Quick Attack, Bibarel improves Pikachu's Hit Points and Primeape improves Iron Tail. 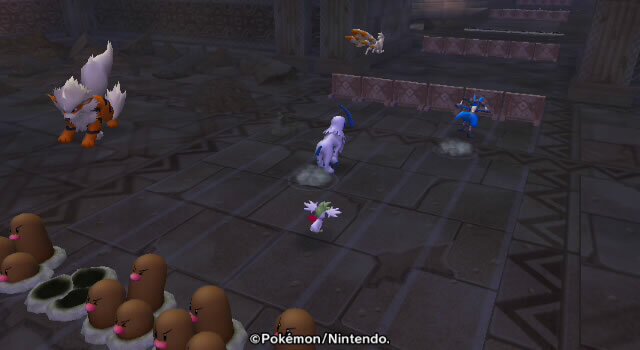 Photography: Along the game, the player will receive a camera from Misdreavus allowing them to take pictures of their gameplay. They can store up to 30 picture and check them by talking to Misdreavus again. 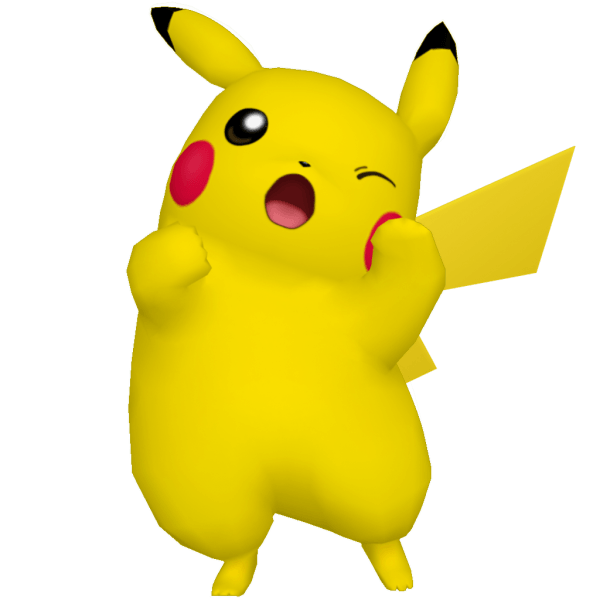 Check out these videos of PokéPark Wii: Pikachu's Adventure including game trailers, tv commercials, the games intro and more. PokéPark Wii: Pikachu's Adventure, Official E3 trailer. The intro / opening Cinematic, the adventure begins. A U.S TV Commercial for PokéPark Wii: Pikachu's Adventure. A selection of Music and Themes that were present in the games data files but never made it to the final release. The Flower Zone and the Cavern Zone are the only two zones that do not have any of Eevee's evolutions. 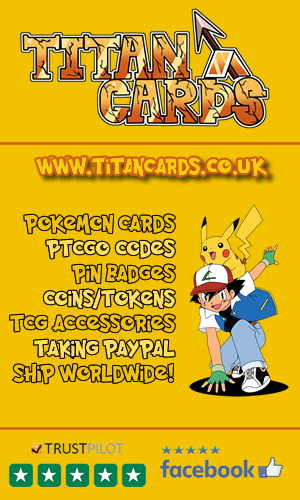 The titans and Kyogre are the only legendaries from the third Pokémon generation to not appear in the game. Since the game uses anime Pokémon voices, and Porygon-Z appears in it, it is given a voice, despite the fact that it never appeared in the anime. Mew is the only legendary from the first generation of Pokémon. There is a typo in the line "not so far away from your Empoleon" where "your" should be replaced with "you". The line is used just before smashing the door to Empoleon. Some U.S TV Commercials for PokéPark Wii: Pikachu's Adventure have a modified version of the Pokémon Animes original intro theme playing during the commercial. PokéPark Wii: Pikachu's Adventure managed to achieve reasonable sales, as it sold around 187 thousand copies in Japan, and 60 thousand in USA and 38 thousand in Europe, within the first three weeks of its release. The game sales then kept going steadily, to date reaching 320 thousand in Japan, nearly 330 thousand in the USA and around 81 thousand in Europe, to finally reach a total of 1.17 million copies, sold around the globe. Kristine Steimer from IGN thought that the game "offers a lot of content" and an "adorable and family friendly experience", grading it 7.5/10, the equivalent of "Good" on the IGN scale. Jane Douglas from GameSpot thought that the Pokémon themselves were the best feature in the game, but she still gave it an average score of 5.5/10, which equates to "Mediocre" on the GS scale, stating that it's a game designed mostly for the young Pokémon fans. 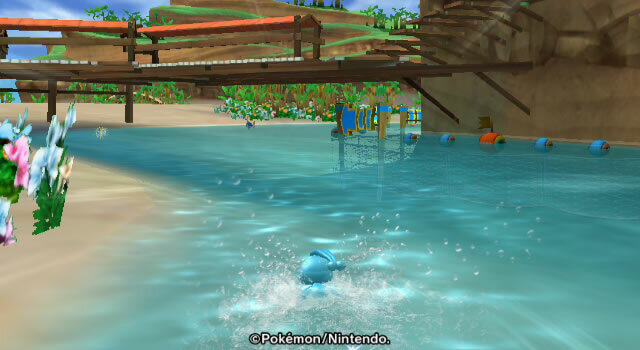 On GameRankings, PokéPark Wii: Pikachu's Adventure earned a great score of 64.80%, over 15 reviews, while it received another respectable one of 62% on Metacritic, over 22 critics. 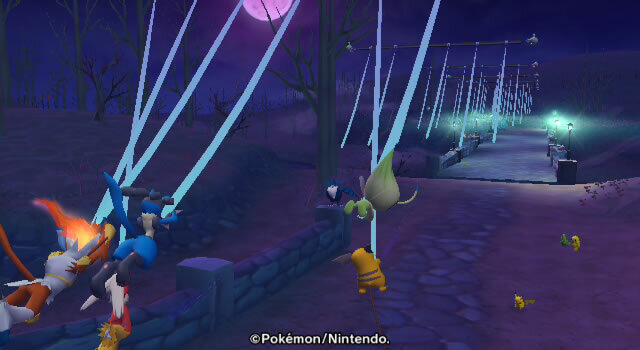 Overall, most reviewers enjoyed the game mechanics and the graphics, especially the Pokémon animations that highly contributed in the game's success. Piii... Pika! !